Lypex Pancreatic Enzyme Sprinkle Capsules for Dogs are a veterinary pancreatic supplement for the management of exocrine pancreatic insufficiency, irritable bowel syndrome, brush border enzyme deficiencies and bile salt dificiencies. In the case of pancreatic insufficiency long term enzyme supplementation and feeding of a highly digestible carbohydrate meal with low fat, high protein content is the only real management. Most pancreatic preparations are available in a powder form and these enzymes are not protected from acid digestion. Lypex is unique as the pancreatic enzymes are made into micro-pellets and each pellet is enteric-coated. This gives 100% protection to the enzymes from the damaging stomach acids. Within minutes of Lypex passing the stomach to the alkaline environment of the small intestine, the protective enteric coating dissolves and releases the protected enzymes to maximise digestion. Capsules should be broken open and sprinkled over food. They should be spread over all daily meals and should NOT be administered whole. Same here regarding mouth with powders.Smelly breath and unexplained tooth problems resulted in 7 extractions! No bad breath with Lypex and I think it is effective for longer, re daytime treats. This may seem expensive but I found that the powders were not contolling the dogs EPI and he had problems with his mouth. 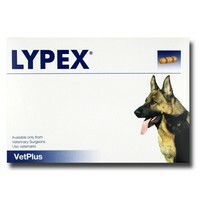 If i keep to his diet and make sure that there are no added extras from any source the Lypex does the job perfectly.